My friends know I’m into 3D printing, so they send me articles and tell me when they hear something about 3D printers. “Hey, did you hear you a print a working wrench, Mark?” Yes, about a million times I have, I say only to myself. And then I thank them. But Friday someone emailed me with something I hadn’t heard before. He and his wife were watching Wednesday night’s CSI (Las Vegas) show and told me that 3D printing had a part, specifically, a 3D-printed gun. 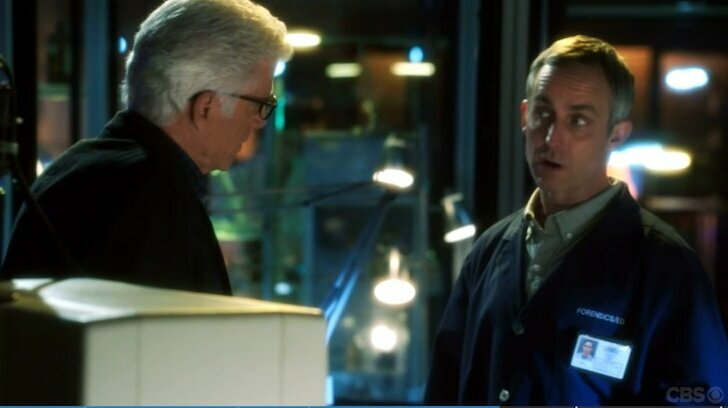 I used to watch CSI (getting a bit tired of all the gore now), but still had the season recording automatically on my DVR, so I sat down and watched it. 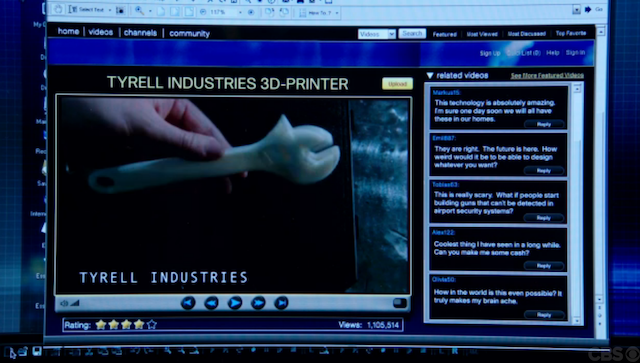 Sure enough, they found a way to incorporate 3D printing into the crime show. I would prefer that millions of people be introduced to 3D printing for their first time seeing some other more positive aspect of it, but nonetheless it was thrilling to see our little not-quite-so-under-the-radar-anymore technology hit primetime Wednesday on CBS. The episode is called Strip Maui (Season 13, Episode 9), and can be watched at CBS.com here. I could tell you at what exact point in the show they talk about 3D printers, but I’m going to make you watch the whole thing, complete with killers, drug dealers, transvestites and hookers like I had to. In a nutshell, someone was shot dead, with a gunshot wound to the head, and David Hodges, played by Wallace Langham, believes it was from a plastic gun. After some research, he proposes to D.B. Russell, played by Ted Danson, that it was printed with a high-end 3D printer, so that the weapon could be unique, untraceable and disposable. Here’s the conversation, when Hodges tell Russell his theory. I won’t tell you if they caught the bad guy. Spoiler Alert: Of course they caught the bad guy, it’s a TV show. 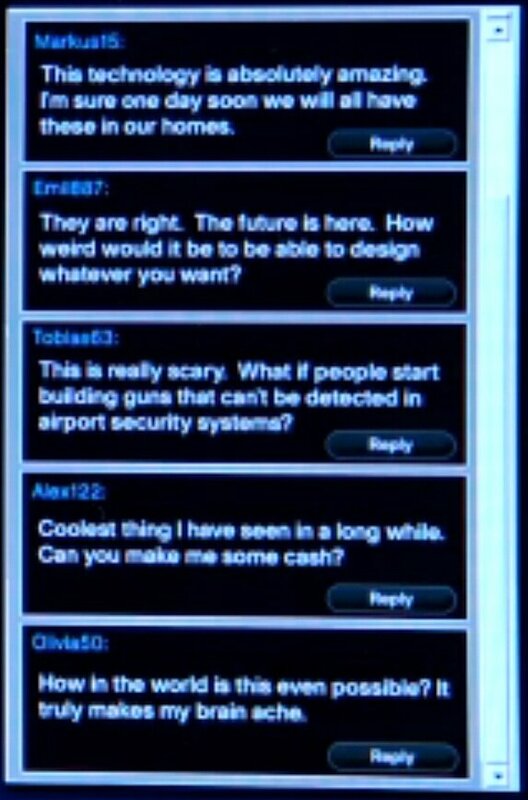 A screenshot from the video Hodges was showing to Russell. Now, if you want to see something amusing, zero in on the text scrolling on the right side of the screen. If you cannot read it, click on this image and you’ll see a larger view of just that part. It’s pretty funny and not something you would have read on the TV screen. The potential to 3D print a gun was one of the hottest topics in 3D printing this year. First a gunsmith made a firearm part, then the legal arguments began, then a printable gun project makes news, especially when Stratasys takes back their 3D printer. It’s all quite the drama and promises to continue in 2013. I appreciated that CSI actually attempted to explain 3D printing, in the short time allowed. Of course it was lacking, but it was something. And they managed to include a video they made up of a 3D printer making an adjustable wrench, which is always a crowd pleaser. Hey, I even learned something–that one of the two primary things 3D printers are used for is to print parts for antique cars. Maybe they consulted with Jay Leno. The episode did bring up another thing, albeit unintentionally, that will be a huge issue in the future. And that is being able to trace something that was printed. In this show, they didn’t try to trace the gun itself; they only checked with the 3D printer manufacturer (the manufacturer, like there is only one) for a list of buyers. But in our article, “Could your 3D printer someday spy on you?” we took a look at how there are proponents (and one with a patent) that would like to force 3D printers to somehow “watermark” a printer’s serial number or other identifying characteristic on each and every model a 3D printer outputs. While that would not have helped the CSI crimefighters in this case, since they didn’t have the weapon in hand, it certainly would have helped to nab the killer if they had found the gun. That would be good for catching shooters, but another nail in the coffin where I find freedom lately. So, my thanks goes to CSI for exposing 3D printing to many people that have not yet never heard of the technology. The funny thing is, I will bet anything that a large number of people who watched this believe the show simply made up the concept of 3D printing, a little science fiction, because that Star Trek stuff is just impossible.